As I was preparing Thanksgiving dinner this year I thought about an item that has become almost obsolete, unless one is a professional chef. I'm referring to an apron. An apron was a mandatory item of outer wear for a woman when I was growing up. My first sewing project was an apron. My mother made aprons every few years for the women in her Sunday school class (for Christmas). 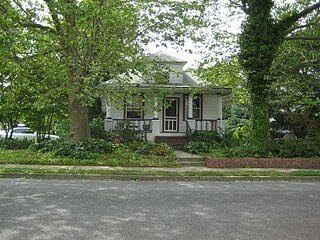 My mother always wore an apron in the kitchen, but never in the other rooms or our tiny house. After all it was kitchen attire, not dining room, or any other room attire. I don't recall seeing her put on her apron, but she was wearing it every time I saw her in the kitchen. 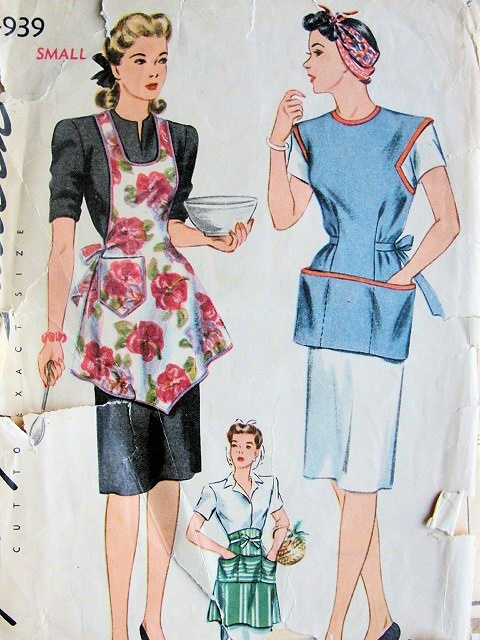 And mostly she wore an all-over apron like the one pictured. In fact, my mom had this exact pattern for making her own aprons, and mostly she made them out of scrap materials. Mom didn't quilt, she made aprons. After all an apron was always an appropriate gift to give to a woman for any occasion. My mother also wore her apron when she was in the basement doing laundry, or in the back yard hanging clothes. She wore the short coverall pictured above in her garden. I didn't like to wear an apron, and thus never got into the habit of putting one on when I cooked. Not even when I was first married and had many aprons in my hope chest from which to choose, did I wear one. I don't know exactly when aprons became almost obsolete, but I'm glad that there is now a resurgence in the use of this attire and not just for professional chefs. Martha Stewart, I'm not, but guess what? This Thanksgiving I did wear an apron. YES, I still have some really old aprons in my kitchen linen drawer!